Buckeyes won the game 20–7. 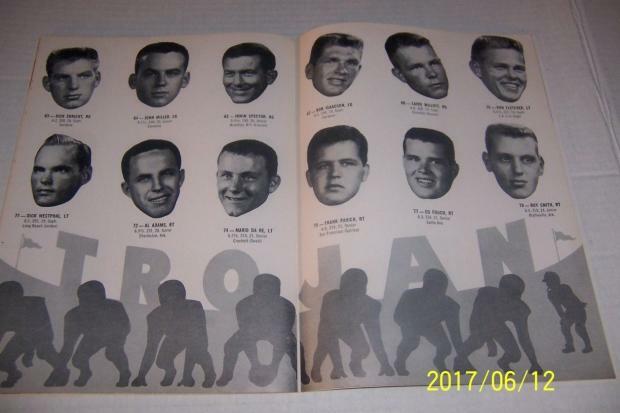 The 1954 USC Trojans Football Team represented the University of Southern California (USC) in the 1954 college football season. In their fourth year under head coach Jess Hill, the Trojans compiled an 8–4 record (6–1 against conference opponents), finished in second place in the Pacific Coast Conference, lost to Ohio State in the 1955 Rose Bowl, and outscored their opponents by a combined total of 258 to 159. Leuzinger High School's Coach Ike played football for USC from 1954 to 1956. #67 Bob Isaacson, Left Guard is pictured on right page, top row... first photo.